There's a lot more to Dubai than sunshine, shopping and lots of really big buildings. 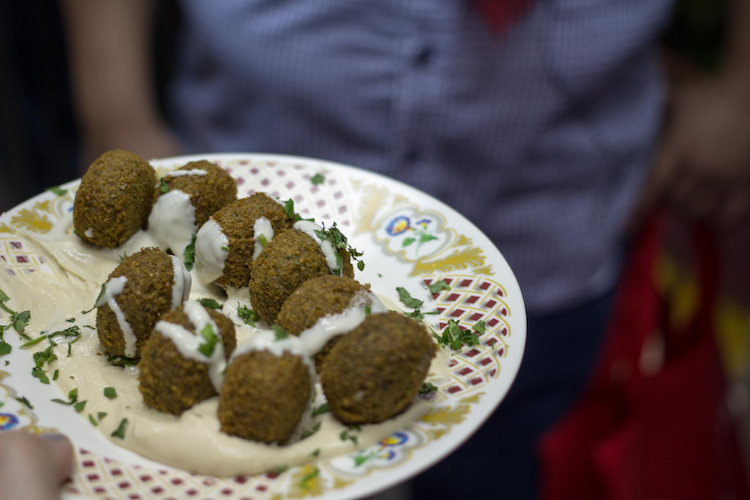 As Sharon Stephenson discovers, it's also a place to eat delicious Middle Eastern food. Most of us have things we regret not buying on holiday. Perhaps it was a vintage camera from that tiny shop on the Left Bank in Paris that you kick yourself for not nabbing. Or maybe it’s a pair of beautifully embroidered slippers from a dusty Indian market, or even a quirky Statue of Liberty snow-dome. For me, it's saffron from Dubai's spice souk. In New Zealand, the tightly-packed crocus flowers can retail for up to $10,000 a kilo (it's not for nothing saffron is considered the world's most expensive spice). But pinned to the left flank of The Creek in Old Dubai is the colourful spice souk where I could have picked up a small packet for around $NZ20. To my eternal regret, I left empty-handed. The spice souk, Dubai. Credit: Alex Berger/Flickr.com. Most people don't associate the second largest of the seven Arab Emirates with food. Shopping, yes; gold, certainly; the world's largest man-made structure (the 828m high Burj Khalifa), absolutely. But Dubai has more than 5,000 restaurants – foodie delights await, if you know where to look. Old Deira, a tangle of streets north of The Creek, is about as far as you can get from Dubai's glittering glass-and-steel towers. But it's where you must go to experience what this former fishing village was like before oil was discovered beneath its sand. The area might look a bit grimy, but you'll no longer care once you sample the food on offer. It’s easy enough to navigate on your own, but an English-speaking guide can introduce you to those tiny hole-in-the-wall places you'd never be able to find. Arva Ahmed is such a guide. The former management consultant started Frying Pan Adventures in 2012, to open visitors' eyes, and taste-buds, to some of Dubai's most authentic culinary experiences. It’s why 11 of us – from the UK, US, Australia, New Zealand and Bermuda – gather one Wednesday night for the three-hour Middle Eastern Pilgrimage Tour. It might be 6.00pm, but it’s still so hot we feel like chooks in a rotisserie. Thankfully Arva dispenses water bottles, along with interesting snippets about the area and its multi-ethnic inhabitants. It’s soon obvious why we were warned to come with empty stomachs. Our first stop, Qwaider Al Nabulsi, has been turning out Middle Eastern food for decades, and the servings are generous to a fault. 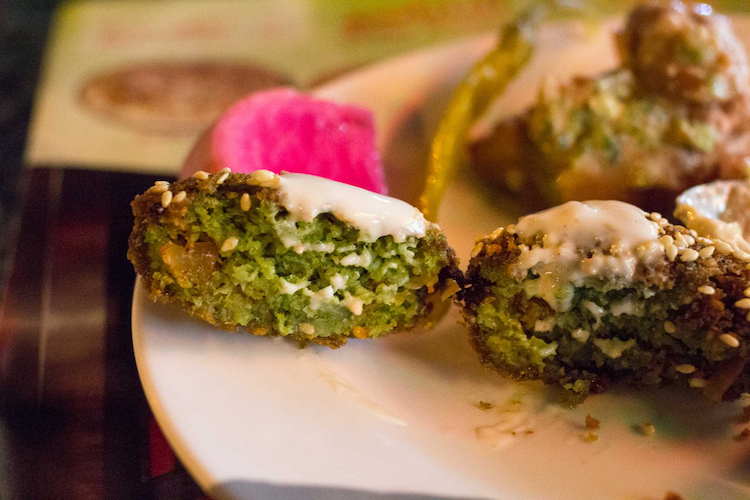 The specialty is felafel, but not as we know it: this, the Palestinian version, comes stuffed with chilli paste, sumac and onions. We learn how to assemble these traditional 'sandwiches' with hummus, tatbeela (a mash-up of capsicum, coriander, parsley and lemon juice) and 'foul', an Egyptian riff on slow-cooked fava beans that tastes vastly better than its name would suggest. We’re on slightly less familiar territory at our second stop. Here chefs layer crunchy noodles over runny goats cheese on a hot plate to make kanafa, a type of Palestinian cheese pastry which is as unusual as it sounds, but so delicious it’s hard to stop eating it. We’re back into the savoury goodies at our next stop, on the busy Al Rigga Road, where Egyptian feteer, a version of a tossed pizza, comes layered with basturma (beef pastrami), cheese and veggies. With so much food already down the hatch, we hardly need any more calories but when Arva tells us we’re about to stop for dinner, we collectively wonder how we’ll cope. Al Tawasol is a traditional Emirati restaurant where we remove our shoes to sit cross-legged on the floor, as the locals do. We start with a spicy lentil soup that’s followed by Harees, a traditional meat and wheat porridge. Miraculously, the heaped platters of chicken and lamb doused in Emirati spices also disappear. Arva helps us get our heads, and our hands, around traditional-style eating which involves making a small ball of food with the right hand and using the thumb to get it into our mouths. It’s a lot of fun and we soon get the hang of it. 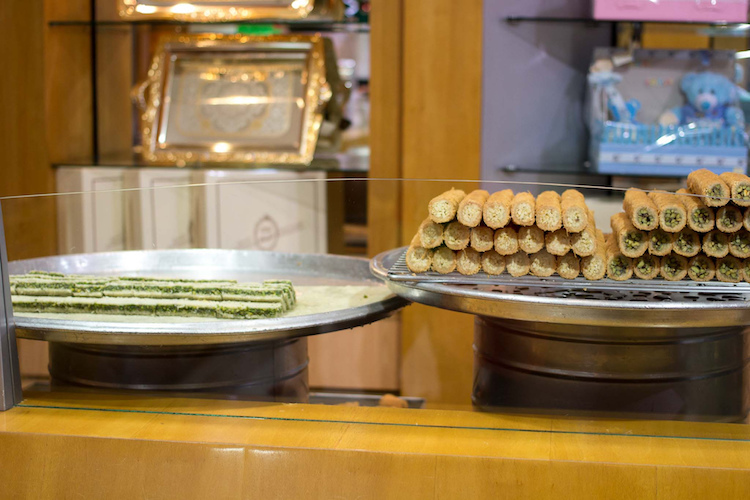 And then it’s time for our last stop, Samadi Sweets, where we manage to squash in baklava and pistachio spiced date cookies, washed down with Gahwa, a traditional cardamom coffee. 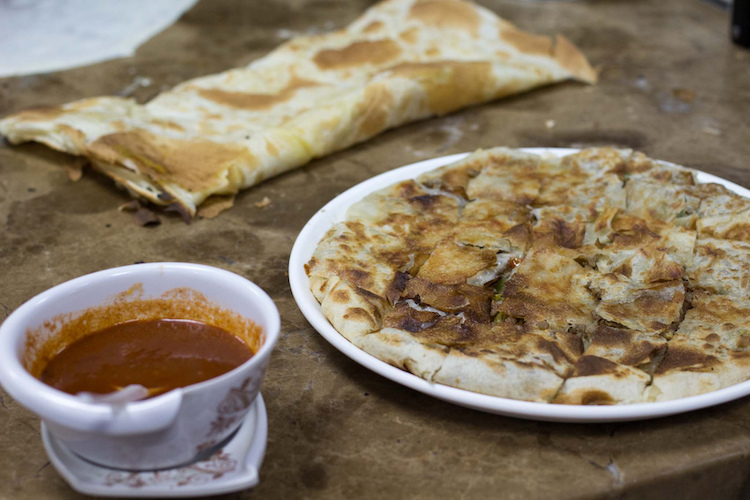 Dubai may be a big, brash monument to cash – but it’s also packed with tradition and delicious food. Next time you’re there, do yourself a favour and check out some of the more traditional food on offer. Sharon Stephenson is is a Wellington-based freelance writer, editor, copywriter and PR consultant. She was the 2013 Cathay Pacific Travel Writer of the Year.